We sell Eleven O'Clock products like Tick Tock Organic Loose Leaf Rooibos Tea 100g online in the UK and directly from our award-winning store in Scotland. Organically grown, naturally caffeine free and low in tannin, Tick Tock can be enjoyed at any time, even at bed time. Tick Tock‘s deep colour and full taste make a delicious cup of tea, and it’s well known for its health properties too. Organically grown, naturally caffeine free and low in tannin, Tick Tock can be enjoyed at any time, even at bed time. Tick Tock is still harvested by hand and cured in the traditional way, as it was when Grandfather Benjamin Ginsberg founded Rooibos over 100 years ago. The process takes place in the crisp air of the Cedarberg Mountains of South Africa's Cape. It requires great skill to know when the cure is at its peak; one sign is that it begins to give off a delicious sweet aroma that attracts wild bees. Did you know you can use tea as a flavouring in all sorts of cooking? These vegetarian jellies are simple to make and you can use all sorts of fruit, whatever is in season! This recipe contains 3tsp loose rooibos tea (redbush tea). We sell real Eleven O'Clock and other Herbal Teas directly from our shop in Scotland and online throughout the UK. View more products from Eleven O'Clock. Where can you buy real Redbush Tea - Loose safely online? If you are wondering where you can buy Tick Tock Organic Loose Leaf Rooibos Tea 100g safely online in the UK, then shop with us. We are an actual health foods shop; with real people selling real foods and products. Our award-winning independent shop is located in Stirling, Scotland since 1976. You can buy our Herbal Teas in store or safely place an order with us online or over the phone. 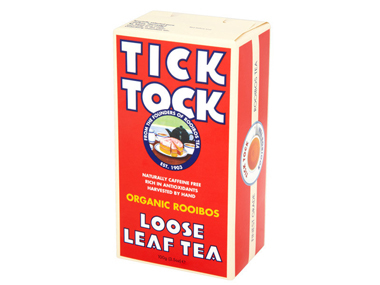 Redbush Tea - Loose - Tick Tock Organic Loose Leaf Rooibos Tea 100g in Herbal Teas and Tea Loose & Bags.